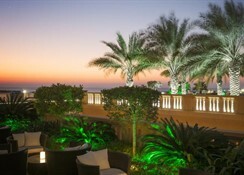 Sofitel Dubai Jumeirah Beach is a five-star property amidst the tall and majestic buildings of JBR in Dubai Marina. It offers second-to-none hospitality and services, including posh rooms and amenities, classy restaurants and bars, giant size pool, spa and fitness centre, above all proximity to important landmarks. 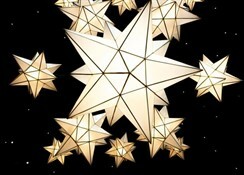 It caters to families, couples, honeymooners, solo and business travellers alike. Sofitel Dubai Jumeirah Beach rises brilliantly from Jumeirah Beach Residence (JBR) in the core of Dubai's most famous promenade "The Walk" and the new beachfront low-rise recreation "The Beach." 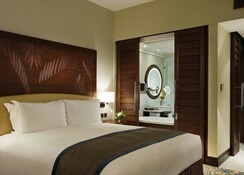 This extravagant 5-star hotel offers 438 guestrooms and suites opened to private galleries with ocean views. Find a mix of French craftsmanship de-recevoir and Arabian style: warm hues, teak decorations, Middle Eastern themes reviewing the puzzle of the Orient – breath-taking yet inviting. Located in Jumeirah Beach Residence in Dubai Marina, one of Dubai’s fanciest places, the view from the rooms is simply mesmerising. Designed in utter-sophisticated French and Arabic style, the interior is simply elegant. 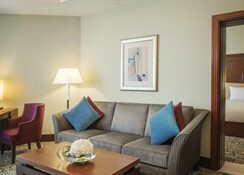 The hotel is surrounded by shopping areas, cafes, restaurants and bars, making it convenient for all kinds of travellers. The beach is around 70metres from the hotel — other important landmarks include the Palm Jumeirah (5km), Burj Al Arab and Souk Madinat Jumeirah (7km), Jebel Ali Free Zone (10km), Emirates Mall and Emirates Golf Club (10km) Dubai Mall and Burj Khalifa (20km), Financial and Exhibition Centre (22km), Dubai Museum, Bastakiya and Gold Souk (30km), Global Village (30km), Dubai International Airport (33km) and Abu Dhabi International Airport (100km). 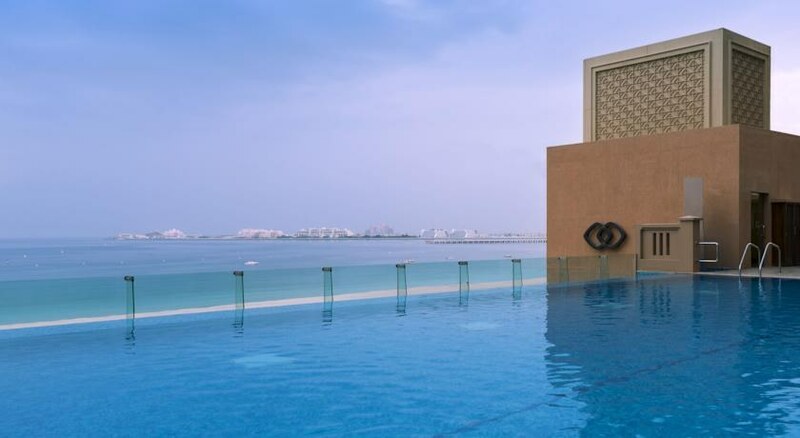 Sofitel Dubai Jumeirah Beach offers 186 Superior Rooms, 66 Luxury Club Rooms, 120 Luxury Rooms, 26 Superior Twin, 27 Junior Suites cater, Imperial Suite and Prestige Suite. Beds are ultra-comfortable and are available in either two singles beds or one king size bed. Safe deposit, mini bar, en suite bathroom, shower, bathtub, separate WC, hairdryer, TV with satellite connection, telephone, dressing area, ergonomic station, Wi-Fi connection and coffee/tea maker are some common facilities. 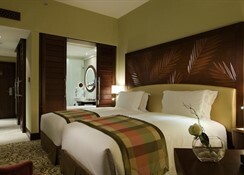 Additionally, the rooms offer a pillow menu, 24-hour room service and laundry services. 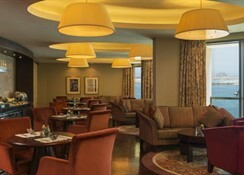 The hotel has an assortment of restaurants, cafés and bars. The Plantation Brasserie is open from 6am – 2am and serves scrumptious meals; A.O.C. All-Day Dining serves French and International cuisine from 6am – midnight (breakfast, lunch and dinner); Plantation Bar serves Mediterranean cuisine; Infini Pool Lounge is the poolside bar that offers alcohol, shisha and snacks menu between 10am – 2am. The hotel has a large fitness centre with sauna, steam and cool-off rooms that remains opens 24/7 for all guests. Other relaxing amenities include a luxury spa and beauty salon that offers refined hair styling, skin treatments, make-up and a list of massages. Also to look forward is the super large swimming pool built right on the beach, surrounded by sunbeds and parasols. Otherwise you can contact the tour desk and go on a desert safari, sand-skiing, sand rides, scuba diving, deep sea fishing, mountain climbing, golfing, shotgun shooting, go-karting, bowling and ice skating. Kids under the age of 16 years are offered free accommodation. All cards are accepted for payment. Our stay was magnificent. Great beachfront location, with designer shops dotted around nearby. Our stomachs were also thrilled to have a Cheescake Factory and Shake Shack right in front of the hotel. The hotel facilities were luxurious, staff were very accommodating and best of all a five star stay at a reasonable price!